Ask The Headhunter PDF books! Visit the Ask The Headhunter Bookstore now! Save 40%! Pick your books and enter discount code=MERRYATH when checking out. Take 40% off your entire order! This is a limited-time offer good only until New Year’s Day. Finding a job is not about prescribed steps. It’s not about following rules. 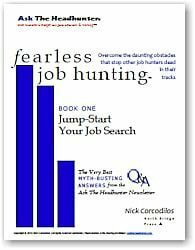 In fact, job hunting is such an over-defined process that there are thousands of books and articles about how to do it — and the methods are all the same. But we all know that doesn’t happen. That’s why I wrote Fearless Job Hunting. Try Ask The Headhunter for free! The key to successful job hunting is knowing how to deal with the handful of daunting obstacles that stop other job hunters dead in their tracks. I didn’t bring you here just to sell you books for 40% off. Of course, I’d love it if you’d buy my books, but Ask The Headhunter regulars know I publish my advice for free. My business model is simple: If you love what you read here for free, you’ll see the value in buying my books. But that’s up to you. My job is to keep delivering tips and advice you can find nowhere else — tips and advice you can use now. So try Ask The Headhunter for free! Thanks to all of you for your contributions to this community throughout the year. Have you ever settled for the wrong job, or failed to scope out a work community before accepting a job? Did you get stuck with a salary cut, or with a surprise when you took a job without doing all the necessary investigations? Let’s talk about it! And have a wonderful New Year! take 40% off by using discount code=MERRYATH when you check out! Click here to visit the Ask The Headhunter Bookstore!